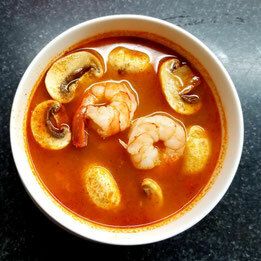 Combination of seafood in hot and sour soup with fresh mushrooms, cilantro, lemon grass, kaffir lime leaves and chilli oil. Note: Every soup has a chicken stock base. 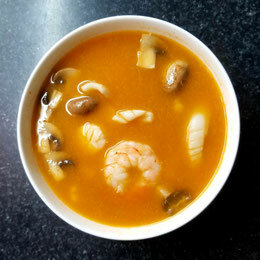 Prawns in hot and sour soup with fresh mushrooms, cilantro, lemon grass, kaffir lime leaves and chilli oil. 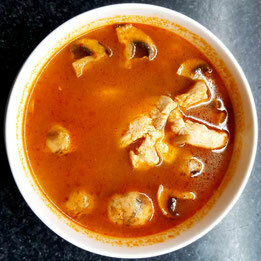 Sliced chicken in hot and sour soup with fresh mushrooms, cilantro, lemon grass, kaffir lime leaves and chilli oil. 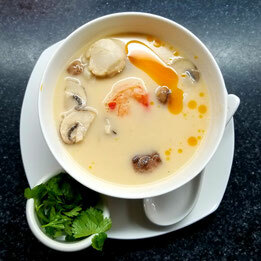 Combination of seafood in creamy coconut milk with fresh mushrooms, cilantro, galangal root, kaffir lime leaves and chilli oil. 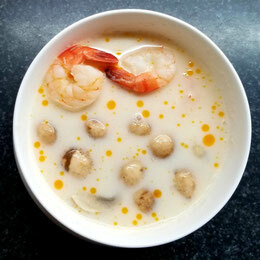 Prawns in creamy coconut milk with fresh mushrooms, cilantro, galangal root, kaffir lime leaves and chilli oil. 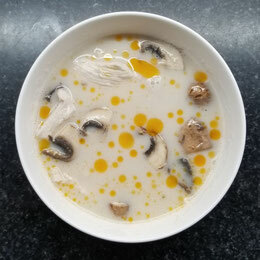 Sliced chicken in creamy coconut milk with fresh mushrooms, cilantro, galangal root, kaffir lime leaves and chilli oil. Share Sookjai with my friends!